Researchers: Michael A. Floyd, Massachusetts Institute of Technology; Richard J. Walters, Durham University; John R. Elliott, Andy J. Hooper, and Tim J. Wright, University of Leeds; Gareth J. Funning, University of California, Riverside; Jerry L. Svarc and Jessica R. Murray, United States Geological Survey, Menlo Park; Yngvar Larsen, Norut, Tromsø, Norway; Petar Marinkovic, PPO.labs, Den Haag, Netherlands; Roland Bürgmann, University of California, Berkeley; and Ingrid A. Johanson, Hawaiian Volcano Observatory. Using GPS and Sentinel 1 radar imagery, the slip along the West Napa fault zone (WNFZ) during and after the Mw6.1 2014 South Napa earthquake was measured. The complexity of the slip and afterslip suggests that hard rock and soft sediment heterogeneity control the style of friction on the fault plane. The post-earthquake deformation caused damage and revealed the fault properties; these are important details to consider for estimating earthquake risks and understanding fault processes. The South Napa earthquake occurred in a region with about six continuous and permanent GPS stations within 25 kilometers of the surface rupture. 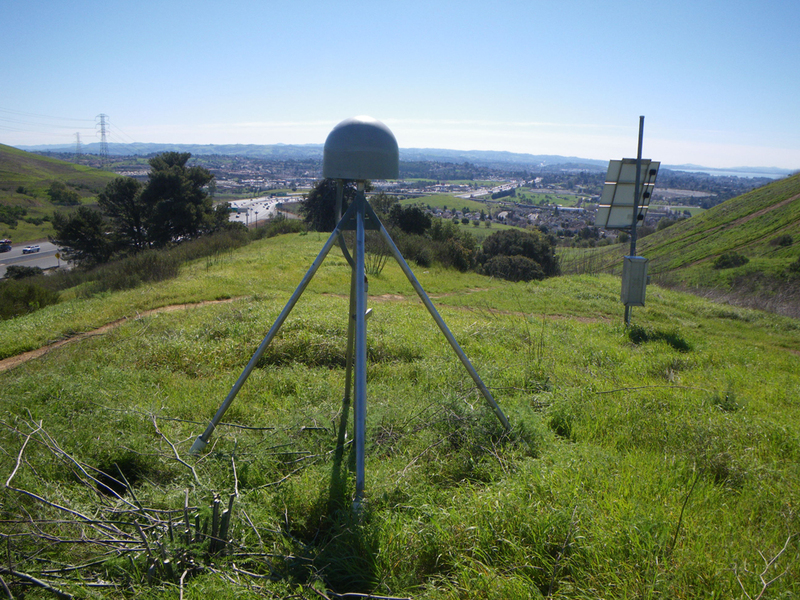 These permanent stations are operated by the Bay Area Regional Deformation (BARD) group and UNAVCO's Plate Boundary Observatory (PBO), a component of EarthScope. These networks are not close enough or dense enough to measure in detail the earthquake slip and the post-earthquake slip, so previous survey GPS sites (about 26) were re-established for a few weeks to capture more information about the fault properties. Many of the survey sites were originally measured by the California Spatial Reference Center (CSRC) and subsequently measured regularly by collaborators from the University of California, Riverside (UCR) and the Massachusetts Institute of Technology (MIT). Other sites were set up by the U.S. Geological Survey (USGS) and measured repeatedly by the USGS and UCR-MIT. USGS and UCR-MIT re-occupied the sites within 48 hours of the event and continued the survey for between 7 to 25 days after the event. The previous survey was completed just seven weeks before the earthquake, so the geoscientists were able to gather exceptional measurements of the fault motion. In addition to the GPS measurements, the authors processed synthetic aperture radar (SAR) data from the Sentinel-1 satellite, a relatively new space mission from the European Space Agency (ESA). Six interferograms (InSAR), one encompassing the earthquake and five from different times after the earthquake, were acquired to measure deformation during and after the event. Airborne Lidar data of the Napa watershed were acquired by the National Center for Airborne Laser Mapping (NCALM) and accessed through OpenTopography (OT). UNAVCO helps to manage OT through an NSF grant with several partners. 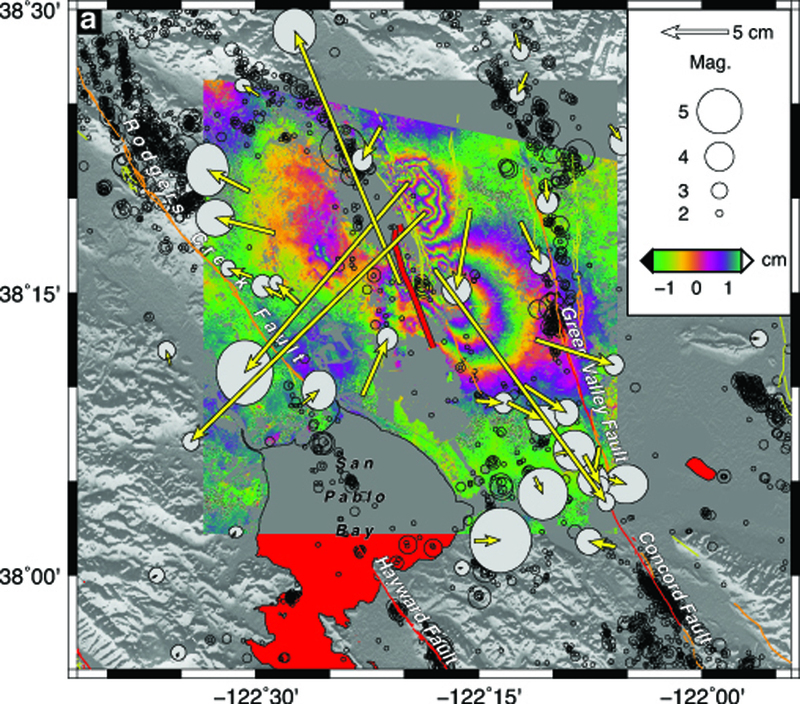 The combined GPS and InSAR data shows the peak slip during the earthquake of 1.6 meters occurred at a shallow level on the main fault trace north of the epicenter where the most surface displacement was measured in the field. Other significant slip occurred at depth between the main patch of slip and the hypocenter and on a northern segment that is adjacent to the main fault trace. 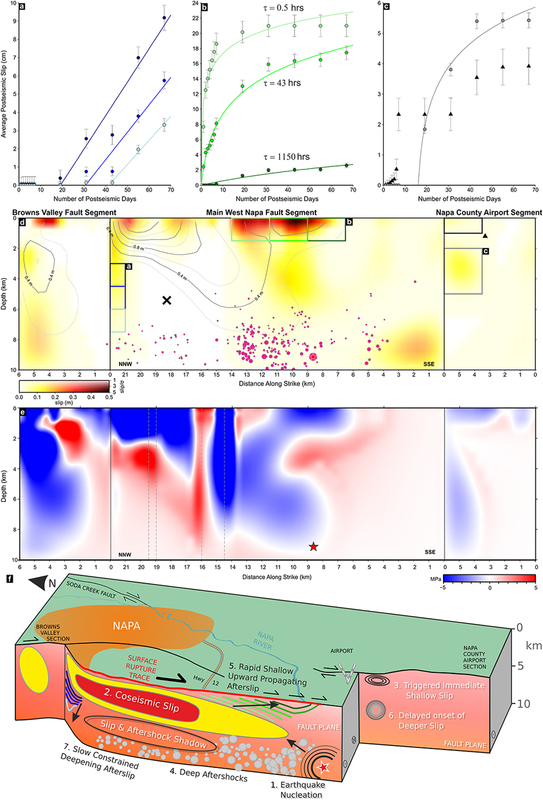 The combined data shows that there was probably triggered shallow slip right after the earthquake to the south of the hypocenter and additional shallow slip propagating upward from the peak slip on the main fault trace. Additional slower and deeper afterslip was measured further north along the main fault trace and PBO’s GPS site P261 shows the deformation to the south of the hypocenter continuing about six months after the event. The complex slip and afterslip is probably related to the local lithology. To the north, a ridge of mountains comprised of hard basement rock on the west, adjacent to a valley filled with alluvial deposits on the east, can limit the rate and amount of afterslip. To the south, a small delta transitioning to a bay and marshland, comprised of thick sediments can allow slow to fast afterslip over a longer time. It is possible that the significant afterslip in the softer sediments was triggered by the mainshock and that the soft sediments allow the fault to essentially creep along without any detectable earthquakes long after the event. The complex slip and afterslip will need to be accounted for when considering earthquake hazards. Floyd, M. A., et al. (2016), Spatial variations in fault friction related to lithology from rupture and afterslip of the 2014 South Napa, California, earthquake, Geophys. Res. Lett., 43, 6808–6816, doi:110.1002/2016GL069428.